A document of 1569 gives the impression that Little Sutton was then a community of about eighteen subsistence farmers and one or two yeomen, living in houses clustered along the village green, which stretched along Little Sutton Road from the Fox and Dogs to Marlpit Lane. It was not much changed since Saxon times, but change was on the way, it would grow and then decline - there is not much left to see of the ancient settlement of Little Sutton today. The Corn Rent Survey, made in 1824, shows quite a different community. Thirty-eight houses are listed in the schedule, five of them uninhabited. Most of the Little Sutton fields, (the old open field system which had been shared among the villagers in the Middle Ages), were now farmed by only three farmers. Samuel Kempson, who lived in the big house on the corner of Grange Lane (250 on the plan) had 111 acres, William Marler, who lived at the Fox and Dogs public house (237 on the plan) rented his 96 acres from Hacket of Moor Hall, and James Hargreave was also a tenant of Hacket for his farm (506 on the plan) and 35 acres. Twenty-three of the occupants of houses in Little Sutton had no land at all. There was a terrace of six cottages at 248, another of four cottages at 465, a row of five cottages at 493, and one of four at 495. These and another six pairs of houses were mostly owned by landlords who did not live in Little Sutton, and were probably occupied by artisans and farm workers. Not many of these 1824 householders were still there in 1851, when the Census Enumerator’s book gives details of occupations. George Crabtree, who lived at 244 on the plan in 1824, farming nine acres; is given in 1851 as living on “Army half pay (Dragoon Guards)”, 74 years old, with his wife and two daughters. William Marler claims to be a farmer of 120 acres in the census, with no mention of the Fox and Dogs, but his brother and sister are listed in the household as servants, probably looking after the pub. The decline of Little Sutton, reflected in the five empty houses in 1824, was continuing in 1851, when two of the thirty-three houses were uninhabited. In 1846 Sutton had been described as having “little trade, and principally composed of an agricultural population”, and the 1851 census of Little Sutton reflects this, listing lists six farmers and fourteen agricultural labourers. But another twenty-two people who gave their occupation were not engaged in farming. There were a Chelsea Pensioner, an annuitant, and a “proprietor of houses” living on private incomes, while James Greatman was a humble road labourer; there was a grocer, a shopkeeper, a midwife, a monthly nurse, a housekeeper and several servants temporarily out of place. But there were also tradesmen carrying on their crafts in their home workshops - seven shoemakers, two tailors, three blacksmiths, two sawyers, a carpenter, a bench-maker and a cutter. Cottage industries were dying out, however, as the Industrial Revolution concentrated production in big factories, and the 1871 census lists only five people engaged in cottage industries in the 27 Little Sutton houses. 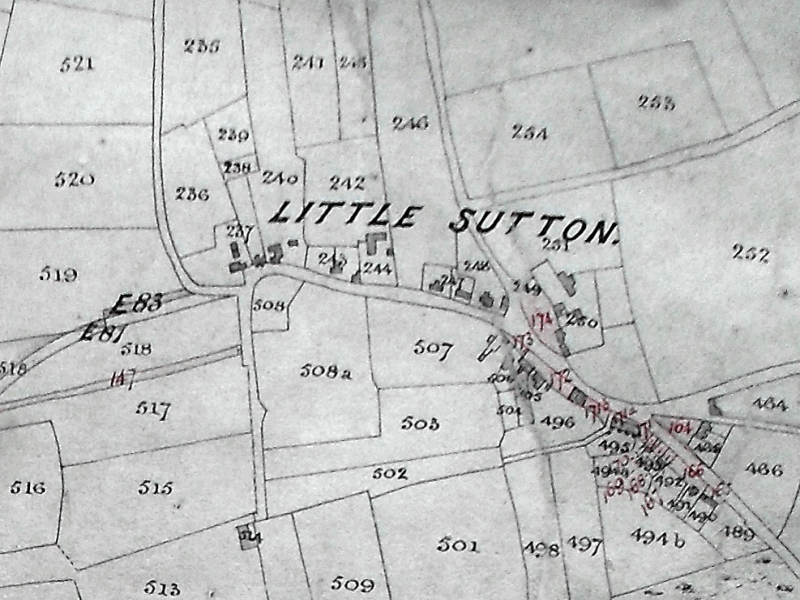 The village of Little Sutton as shown on the map accompanying the Corn Rent survey of 1824. Most of the houses were ranged along Little Sutton Road, from the Fox and Dogs pub (plot 237) nearly as far as the present Sharrat Field (plot 489). The I of “LITTLE SUTTON” on the map points to the north.